With the release of the iphone 5S, featuring the new A7 processor and M7 co-processor, 64-bit pltaform and iOS 7, the all new iPad shouldn’t but implement these extraordinary new technologies. Basically the iPad is everything the iphone 5S is (for a list of features please visit the iphone 5S topic) however the 2 things that weren’t implemented are the Finger Print Identification and the 8 megapixels cam. What is remarkable about this new iPad is it’s size and weight. With that new technology and retina display screen, they made it 28% lighter and 20% thinner from its predecessor, while keeping the same battery life. And the best thing is that, it only weighs 1lb! 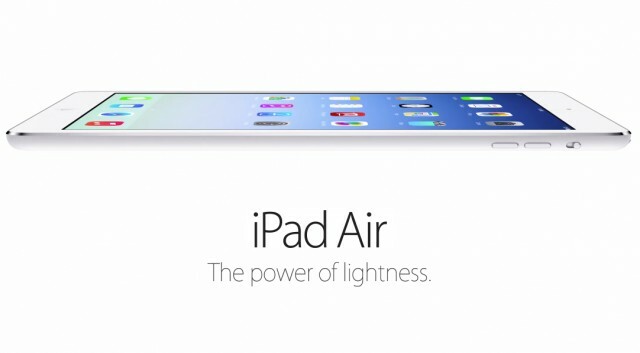 So that’s why they call it the iPad Air, not bad right? The iPad Air is set for release on November 1st with a starting price of 499$ in the US, which is a great price for a tablet that combines all the technology and speed of a modern Laptop in something this small.